This sermon was preached on Sunday the 22nd of november 2015 by Curt Swartzlander during Thanksgiving! He is a lay minister and member of Holiday Island Presbyterian Church in Arkansas in the United States of America. He sent me a copy of his sermon because he used my article ‘It will not be taken away from her. An interpretation of Luke 10: 38-42’. Curt, Thank you very much! The holiday is upon us and all the chaos that comes with it as well. Our home is no exception to this rule. This time of year is especially full of activity for the Swartzlander’s in our normally quiet and peaceful home. My lady and I have the privilege to host the family Thanksgiving gathering at our home annually. Of course, nearly everyone coming to town needs accommodations because of the distance traveled. This puts enormous pressure on us to get the entire house ready inside and out. Lois makes multiple lists to make sure everything gets done so that we are ready for all the company. This includes prepping the rooms and beds with blankets and pillows and sheets for all those coming; inflating the queen size air mattress days ahead to check for those inevitable leaks. Organizing and planning for all the food to be purchased and prepared – not just the Thanksgiving feast (which is massive enough) but all of the breakfasts and other meals for those arriving at different times; cleaning the house inside and out and making sure the bathrooms are organized and supplied and ready for a small army of family and friends. The frenzy of all the preparation makes us both a bit frazzled this time of year; but in spite of the madness and the hustle and the anxiety – it is all well worth it. When the kids and grandkids and family and friends arrive, controlled bedlam fills the house with laughter and energy and fun. And of course the mouthwatering aroma from all the cooking and baking permeates the house. Many of you can relate to the insanity of all this – I see you smiling and shaking your heads. And right now you may be wondering where this is all leading in light of the scripture verse that was read earlier. In a traditional explanation of the Martha & Mary story Jesus seems to chastise Martha for being worried about all the preparations and work to be done. Apparently she was so cumbered with that load that she was upset at her sister Mary for not helping; can any of you relate to the frustration of having jobs to do and others who could be helping are not? Consequently it appears that women are being told they are neglecting their spirituality by focusing too much on domestic duties. And couldn’t this principle apply to men as well? Yes I am including all the males out there too; distracted with jobs or hobbies or other things that leave out time for God. So really none of us are off the hook. But what if this is not the message that Luke intended the reader to understand? Was Jesus really condemning Martha for not taking time like her sister Mary to sit at His feet? On the contrary, I believe there is an underlying truth that may be overlooked when quickly reading the scripture passage. To understand what may be happening in these verses, we must look at the setting of the story. In the 1st century, the status of women was quite a bit different than our modern 21st century western cultural experience. Granted there are exceptions in the world, but life was generally much more difficult and restrictive for females in the time of Christ. An excellent article titled “It will not be taken away from her” goes into great detail about this time period in relation to the story of Martha and Mary. It was written by Hinne Wagenaar during a period where he lectured at the Presbyterian Theological Seminary in Kumba, Cameroon. A Minister and Teacher from the Netherlands, Hinne holds the Master of Sacred Theology Degree. In the article he reported that “although we should be careful not to make easy generalizations, women were expected to remain unobserved in public; their education was generally limited to learning domestic arts; a daughter had none of the brother’s rights and thus was not entitled to possessions; women were handed down from the father’s power to the husband’s, and in case of widowhood, handed down to the power of a brother of the husband. ‘Thank you God for not making me a gentile; Thank you God for not making me a slave; Thank you God for not making me a woman.’ That is their prayer, not mine. And rabbis actually avoided speaking to a woman in public. The Greek word ἐθαύμαζον for surprised means shocked and amazed. They were astonished to find Jesus actually speaking to a woman – holding a conversation in public! In light of this cultural setting for women, there are two things Luke reports in the Martha & Mary story that are quite surprising. First, it is very unusual that Martha not only has her own house, but defies tradition and actually takes the liberty to invite Jesus, a man, into her home. And even more unexpected is that Jesus accepts the invitation . . . an action most rabbis would have frowned on. But Jesus was setting His own standards. He often included those who would be shunned and rejected by many of the religious leaders. In fact, in the gospel of Luke, the story just before Martha and Mary is the parable of the Good Samaritan. In that story a man was attacked and left for dead by a band of robbers; both a priest and a Levite two of the privileged and honored members of Israel’s elite religious leadership failed to offer any assistance. The victim was eventually helped by a Samaritan, an outsider. So is it a coincidence that these 2 stories are placed back to back in Luke’s gospel? Or is Luke (and the Holy Spirit) making a point? Tradition would consider the Samaritans and women as less privileged members of the social order. Since Martha invites Jesus into her house this assumes she is the owner and has the authority to do so. So it is likely that she had some wealth – as did several other women mentioned in Luke chapter 8; women who helped to support Jesus and His ministry. Jesus simply acknowledges and affirms Martha by accepting her invitation! Mary takes a bold step to join the disciples and I picture her as captivated and hungry to learn from the Lord. So was Martha really overwhelmed only by domestic issues and hospitality? A woman of means could also have servants to assist her. Couldn’t Martha have summoned Mary herself to come help her and not bother Jesus with the matter? What was she truly so upset about? Let me set the scene for you as it might have happened. Martha takes a chance inviting the Lord into her house and he accepts! Imagine Martha thinking “Wow, I am so honored and pleased that Jesus is really in my house! I want this to be perfect – oh there is so much to do – I will bless my master with good food and hospitality – now where is that sister of mine? I really could use her help now. I have been so excited and distracted by all this that I have lost track of her. And as Martha peers into the main room she sees Jesus with His disciples gathered around Him – and sitting along with them is her sister, Mary! Maybe I can save Jesus from embarrassment if I give Him a reason to make her leave. I can’t just tell the Lord that she should not be at His feet. How can I get Mary away from this mess? Oh, I know; I will tell Jesus that I am so busy I need Mary’s help. Then he can graciously dismiss her and save any further discomfort. Everyone is stunned! Jesus does not dismiss Mary; instead he openly in front of everyone affirms Mary’s right to be there. It is not a choice of working and doing chores versus being spiritual! The choice is whether she can sit at Jesus feet or not! The one thing that is better and will not be taken away from Mary – is the right to be a disciple. Martha who had taken the bold step to invite Jesus into her home was working hard to take care of her guests. And Jesus validated Martha’s worries, acknowledging her many apprehensions – which included not just domestic duties but also concern about her sister’s actions. Jesus refused to bend to the politically correct behavior which would be to tell Mary to take her place in the kitchen. This opened the way for women to be in the inner circle of the followers of Jesus Christ. Thank God for Marthas and thank God for Marys. Both ladies took daring steps to please the Lord; each in their own way. 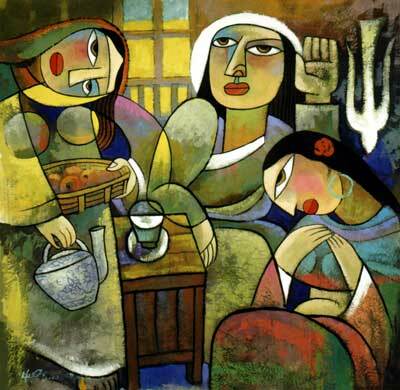 Mary serving Jesus at his feet and Martha serving Jesus with her hospitality and provisions. Ahhh — Thanksgiving. A holiday that needs both the Martha and Mary in all of us.